Al Nabooda Automobiles, the exclusive distributors of Volkswagon in the UAE, has unveiled the all-new Polo Sedan at its showroom on Sheikh Zayed Road. With the highest standards of modern automotive engineering and high quality workmanship, the new Polo Sedan completes the portfolio of sedan models that Volkswagen Middle East and Al Nabooda Automobiles offers to its customers in Dubai, a statement from the company said. Al Nabooda Automobiles has designed a tailored financing offer for customers starting at Dh29 per day based on a five year payment plan for the new sedan. Available with a 1.6 litre 105 PS engine and a six-speed automatic transmission, the Polo Sedan includes 15 inch alloy wheels, dual airbags for driver and passenger, ABS, spacious interior – especially in the rear and central locking with keyless entry. “The new Polo Sedan is the perfect combination of German engineering together with optimum comfort and driving characteristics,” said Thierry Seys, Volkswagen general manager at Al Nabooda Automobiles. 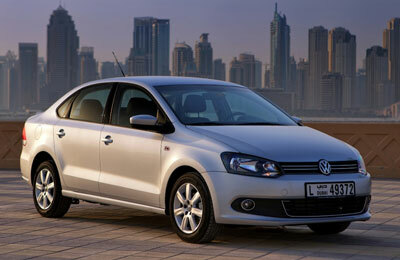 The Polo Sedan has been produced for the Middle East market in Volkswagen India’s plant in Pune. Opened in 2009 the Pune plant is one of the most modern plants in the Volkswagen Group. Volkswagen has an international production network catering to all markets ensuring the reach of German engineering around the world. The Pune facility is the only production plant in India operated by a German automaker and covers the entire production process from press shop, body and paint shop to final assembly. “The Polo Sedan is the entry model into the Volkswagen portfolio and is aimed at a younger demographic who want to experience our German engineering. Many of our customers stay loyal to Volkswagen after their first experience with the brand as we provide quality, affordable innovation and can cater to all their automotive needs. We see high potential for this model in Dubai, and one that will drive volume growth as Volkswagen continues to be the fastest growing volume brand in the Middle East,” said Marcus Butros, sales director, Volkswagen Middle East. The new model has an extended wheelbase which is 82mm longer than the European Polo hatchback. The Polo Sedan has been made for the region offering features such as more rear legroom that reflect the changing needs of the Middle East customer, the statement said. The car also includes ‘Climatic’ manual air conditioning as standard in the S and SE model specifications, with ‘Climatronic’ air condition as an optional extra. The cockpit has a modern leather steering wheel, gear knob, handbrake lever and gear lever, a dashboard design with ergonomic control layout, as well as comprehensive functional equipment with electrically adjustable side mirrors, electric remote unlocking for the boot lid and central locking. The driver-orientated cockpit also includes a radio with CD/MP3 player as standard.